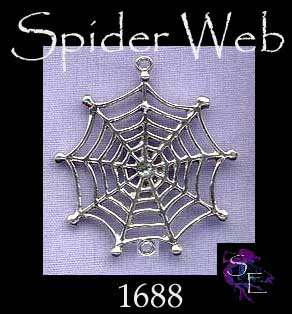 Sterling Silver Spider Web Dangler -- Hang Bead(s) or Spider from, etc to Create your own jewelry style! Has loop at top and bottom. Spider Symbolism - Spider is a master of patterns and webs. Like Snake, Spider is a keeper of secrets; however, Spider draws secrets to itself and does not go looking for secrets as Snake does. Spider creates, crafts, and constructs, but has little compassion or emotion. Spider is of Earth and Air, and its magic involves building, weaving, constructing, and gathering.